The human predicament is known. A gene mutation that occurred many generations ago resulted in a dysfunctional GULO gene that activates the gulonolactone oxidase enzyme needed to convert blood sugar into a sugar-like molecule called vitamin C. A reawakened GULO gene would produce an enzyme (gulonolactone oxidase) that converts blood sugar (glucose) to vitamin C (ascorbate) as it passes through the liver. While most mammals naturally synthesize vitamin C in their liver or kidneys, humans along with guinea pigs, fruit bats, primate monkeys and a few species of fish have a dysfunctional GULO gene that does not code for production of the enzyme (gulonolactone oxidase) that converts blood sugar into vitamin C. Therefore humans and these other species of mammals must totally rely upon dietary or supplemental sources of vitamin C to prevent symptoms of scurvy. In 2013 it was reported that human fetuses maintain a blood level of vitamin C that is higher than that of their mothers. So this gene mutation must occur just prior to or after birth. Since then researchers embarked upon a search for molecules called agonists that could initiate a physiological response in the GULO gene. Humanity has never fully restored vitamin C levels back to levels achieved by natural synthesis even though vitamin C pills have been widely available for a few decades. For example, a 170-lb Billy goat is said to produce ~13,000 milligrams of vitamin C per day and more when under stress. Animals in the wild like primate monkeys and fruit bats make up for their defective gene by consumption of thousands of milligrams of vitamin C from plants per day whereas modern-day humans only consume ~110 milligrams per day from their diet. A 500-milligram vitamin C pill taken every 4-6 waking hours (4 pills a day) would achieve blood levels seen in GULO gene- intact animals and fully replicate natural synthesis. However, vitamin C is water-soluble and is rapidly excreted in urine flow and therefore needs replacement throughout the day. A pill that reactivates natural synthesis of vitamin C would be more convenient and effective. Approximately 15% of Americans actually have blood levels of vitamin C that are so low that they are considered deficient or have subclinical deficiency that produce health problems that are not readily apparent to doctors or patients. 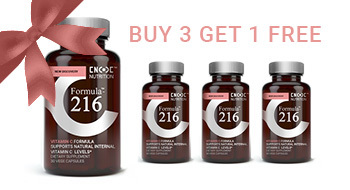 Bill Sardi, Encode Nutrition founder and formulator of Formula-216, says this surprising discovery should make a major impact on the healthspan of Americans.